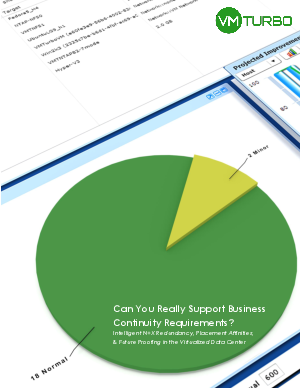 > VMTurbo > Can You Really Support Business Continuity Requirements? Virtualization brought about the ability to simplify business continuity management in IT. Workload portability and data replication capabilities mean that physical infrastructure failures no longer need impact application services, and they can rapidly be recovered even in the event of complete site failure. However, Enterprises and Service Providers face new challenges ensuring they have enough compute capacity in their virtualized data centers to support their business continuity requirements, while at the same time not over provisioning infrastructure capacity resulting in unnecessary capital expenditure.